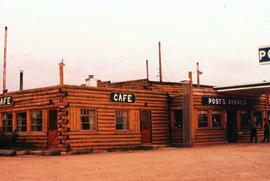 Colour Ektachrome 35mm slide depicts a cafe and post station in Forty Mile, Yukon.Note: Colour adjusted on JPEG. 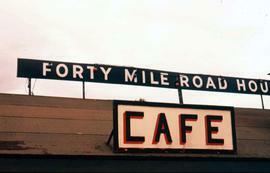 Colour Ektachrome 35mm slide depicts a cafe in Forty Mile, Yukon.Note: Colour adjusted on JPEG. Colour Kodachrome 35mm slide depicts people sitting outside of a café. Colour Kodachrome 35mm slide depicts a group of women, including Phyliss Snider (middle), sitting in a cafe. Colour Kodachrome 35mm slide depicts Phyliss Snider sitting at an outdoor cafe in Nairobi, Kenya. Colour Kodachrome 35mm slide depicts people sitting in a café. Colour Ektachrome 35mm slide depicts a road in Atlin, B.C including buildings of which one is clearly indicated as a cafe.Note: Colour adjusted on JPEG.